The trainings are in English. The trainer also speaks Dutch. The location is Holiday Inn Amsterdam. The price is € 1.195,00 excl. BTW. For registrations, the following conditions hold: conditions. 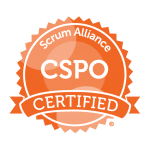 Click on the CSPO or CSM logo for more information about the training content.